The greenhouse is a wonderful place, mainly because it so easily does its job. I’ve certainly gone over a few of its unintended benefits (reduce S.A.D. mid-winter, help take the pressure off the gardener to hurry up and dig, etc. ), but here is another one. Last night it got pretty chilly (28*F) and I wasn’t worried, even though my tomatoes, eggplants and peppers were outside. They were in the greenhouse! In the ground, too, as it happens: I have been moving the lettuce and winter stuff out at a fast rate, and replacing them, as the beds clear, with these tender baby plants. 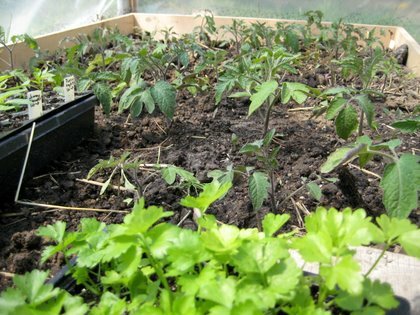 I *hate* transplanting seedings, so the greenhouse beds are a great halfway house for them. I’m also seed-starting things like mad directly in the ground in the greenhouse. Seeds are going into the ground in the gardens, too (peas, favas, carrots, beets, etc.) but I reserve the greenhouse beds for items that, if chilled outside in the ground, will simply go to seed and not do their thing by producing goodies for me. The smaller brassicas are in this category: rapini, pac choi, tatsoi, mizuna. They’ll get to be about an inch tall and I will move them outside. 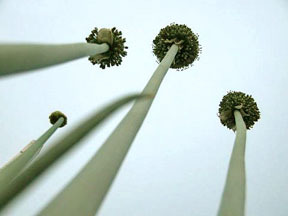 Likewise, anything I want to hurry-up-and-sprout are seeded directly into the chill-proof greenhouse beds. Flowers (marigolds, calendula, cleome, cosmos) fit that category, as does another seeding of yellow storage onions. But in a month the only things that will be in the greenhouse will be the summer crops of tomatoes, peppers, eggplant, and a few garlic plants. I know I sound like such a liar, but it really is a lot less work! My excitement for a greenhouse is fueled even more when I read your intoxicating blogs! I’ve been hooked ever since I read Eliot Coleman’s books last year. So what if I’m a city girl with a large backyard….I’m done trying to keep grass alive so guess where the greenhouse is going…smack dab in my backyard! Can’t wait! It’s very nice from this side to hang out in your greenhouse too. Especially with the new chicks and the guineas nearby. Thanks for the little escapes. Gosh, I hope that 28° didn’t get my brother’s wine grapes! Yikes! Verde: Baby steps! I had been thinking about one for years. Chickens too so it helps to have dreams. Katrina: Thanks! It’s fun on this side, too! Jules: It’s been such a cool spring, the grapes aren’t out yet, unless he’s got a weird site. The redbuds are just now blooming, along with the wild cherries and our plum trees; these are always the earliest. We’re about a week from dogwoods but the magnolias are toast thanks to the frost! It looks lovely! I’m battling slugs in my tunnel at the moment. Argh. I was out for 2 hours last night handpicking them. I guess a few overwintered and with the recent rains they’ve begun multiplying and frightening rate. Hi Vicki! Yep, cattle panels and plastic would be a great way to go, too, and dang it would be cheaper than my method. Trouble is, nobody will deliver cattle panels to my house! But a greenhouse in small pieces? Sure. Anyway, no, I’ve got the same thing going on that you do as far as wildly varying temps in the greenhouse. So I start the heat-loving things under lights in the basement, and simply move them from their seed trays into the ground directly, even though they’re pretty small at the time. (You can see the peppers still in their tray at the left of the photo.) Before I started the tomatoes etc. 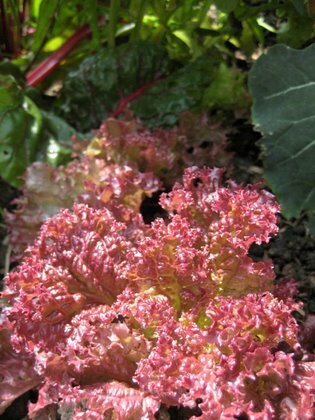 I started a few batches of cold-loving things like lettuces and kales and cabbages and broccoli under lights in the basement, way back in Feb. They got bigger and also got transfered to the greenhouse. These are the things that I am consuming now, or have been transfering outside to the garden, even if there’s still threats of frost. Danielle: Woah. Are yours the freaky big ones? We have little slugs (maybe an inch long at most) and they aren’t much of a problem. They were more of a problem back in October before it got really cold and I had loads of tiny plants in there. My chickens won’t even touch them. They look at me like, you’re kidding, right? Don’t you know how slimy those things are?